The village of Tmatboey comprises 236 families, some from the Kui minority ethnic group, and lies within Preah Vihear province, in the remote Northern Plains of Cambodia. The plains of Preah Vihear are home to the world's largest breeding populations of Giant Ibis and White-Shouldered Ibis – both critically endangered species; in total, the area supports 50 species on the IUCN Red List, and is for many of these species a last refuge, making the Northern Plains a focus for conservation interventions. 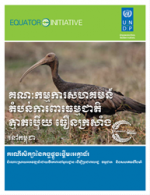 One approach has used revenue from ecotourism to "reward" Tmatboey community members for conserving these rare bird species. 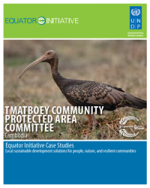 The Tmatboey Community Protected Area Committee, in partnership with the Wildlife Conservation Society, has developed a community-based monitoring scheme in which local residents are paid a small fee for reporting and monitoring nests of endangered species, rather than selling the eggs on the thriving black market operating on the Thailand-Laos border.